I also love "Funny Girl" and know the lines by heart, after playing the video/DVD multiple times. Back in the 60s it was on Broadway, and when I was in NYC I was tempted to see the play, but who heard of Barbra, so we did something else instead. My big loss. Thanks for the memory. I was very close to including Funny Girl in my post in this 52 weeks series. Before I saw the film, I loathed Barbra and I have no idea why. Some friends had been to see Funny Girl and raved about how wonderful it was. She said that if I didn't just love the film, she would pay my $1 admission. I LOVED the film and became a Streisand fan to this day. Also fell for Omar! On long road trips, I break into song with several tunes from the film. "Don't Rain on My Parade" is a favorite as well as "My Man." This was definitely a landmark film for me. In fact, just watched parts of it via the new movie streaming feature on Amazon.com last weekend. "What are they gonna do? Shoot the swans? Deese lovelies?" Barbara and Susan, thanks for the comments. I enjoy sharing our love for Funny Girl and Omar with you. I have some old theater seating from this theater, their painted red with black armrests. I was wondering if anyone out there knows when these seats from? I do know that the interior was updated, hence the reason the theater seats are in my possession. Thanks to anyone who would love to take a guess. They replaced the seats. They moved the old seats upstairs. Hi, I followed a facebook link to this blog because a friend tagged the library in a comment about it. 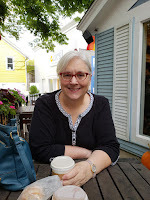 I am the current Director at the Harbor Beach Library, which operates the Community House that houses the Harbor Beach Theatre. I want to comment to Tim Eagle regarding the seats that he has from our theatre. I'm not sure when the downstairs original seats were removed from the Theatre, but at the time they were in this building, they were a dark would with metal sides. It is possible that the seats you have were painted after they were removed from the theatre. The balcony seats were replaced in 1994, so that we no longer have any of the original seats in the theatre. However, we still have some the same type of original seats in our gymnasium. We are currently trying to raise money to upgrade the Theatre's projectors to digital projectors so that we can continue in operation. We have raised close to $20,000 locally and are looking to raise an additional $45,000 for the projector upgrade. Thank you so much for the information you provided on the seats. I remember checking many books out of your wonderful library. It is a treasure to the community.